So I did talk to Bernard, a little about Giuseppi, quite a bit about the label itself and even more about Esperanto. Details to follow. Along with thoughts about a few recent releases. Tonight while I was doing dishes I listened to the album Jacked Up? No More by a band called Animal Time. In 1988, these guys were a big deal to me. It was started by brothers Jeff and Jay Norem. Originally Jay played drums and sang and Jeff played the Chapman stick. On this album they were a quartet. Jay was just on vocals, and they had another guitarist and a drummer. The band was this great combination of Minor Threat-like barked vocals and taut music with weird elements thrown in: harmonica that could sound like screeching tires (intentionally and effectively), riffs that sounded like they were appropriated from soul and of course that Chapman stick. The album contains a bunch of really solid songs. Some are almost great, but even the lesser ones has something going for them. "You Don't Live Around Here," aside from a set of lyrics that don't give Jay a chance to breath between lines, is catchy and hard hitting, lyrically. "Rebel Game" is a pretty spot-on indictment of people who dress the part but don't really have a cause. "It's Like I'm Being You" is really a post-thrash song with a stop at the beginning of each verse: "You're like a Christmas tree with it's lights unplugged"; "Got a heart full of lies and a soul full of gimme." Later that song has the line, "You and me we're a lot alike/ you disgust me, get out of my sight." And for the coda, a trumpet and tenor sax jump and blast an off-kilter (again) mutant soul riff. In the fall of '88, Animal Time played a show at a short-lived Pittsburgh venue called the Foundry, which is just a block down Penn Avenue from the 31st Street Pub. They played with this awful band that was in the Athens, GA film who were adept at ugly songs and screamed singing but couldn't blend the two of them together. I bided my time in the back until Animal Time went on and they were amazing. Afterwards, Jay couldn't believe I was singing along to the songs. He was shocked and appreciative. I was probably hopped up on coffee. I had yet to become a java freak. The band later went to a party that I was also going to and we swapped band stories. But I still have the album. If you ever see it, buy it. I looked up their previous EP, Double Veteran, on eBay and saw a copy for $10. I would've sprung for it had it not been a radio station copy with call letters written across the front. Tonight I'm going to talk to Bernard Stollman, of ESP Records. I could probably throw questions at him all night, but I'm going to try to be polite and stay on topic. I just received a message today from the fine folks at ESP who say that Giuseppi Logan is still alive and well. After having posted about so many musicians who have passed on, it's good to know that many people lost track of is still around. And speaking of ESP, check out the response to the previous blog. I got on the press list for the rejuvenated ESP label and received a package of discs in the mail a couple of weeks ago. In addition to reissuing their infamous back catalog, they've also started putting out new recordings. And not just newly released works by folks like Albert Ayler and Don Cherry. New music from new bands. I'm going to review a few of them for JazzTimes, so I figured I'd devote a couple blog entries to the back catalog. The big criticism that was lobbed at free jazz/avant garde/new thing players in the early days of that music was that the musicians couldn't play their instruments. Otherwise they'd do something besides creating that racket. Anyone who listens to Cecil Taylor - even his greatest detractors - would have to say that he has technique out the wazoo. Albert Ayler might not have been too adept at straight ahead jazz (the clunky themes on My Name is Albert Ayler hint at this), but listen to the tracks on In Greenwich Village where he plays alto. He makes it sound like a tenor, and it's only then that you may realize what an amazing tone he had. It sounds like the entire alto should be vibrating from the gale force airstream he's blowing through the horn. It gave me more appreciation for his tenor sound. He found a way to take his skill and create his own niche with it. Ornette Coleman too - he carved out his own movement and was able to get the sounds in his head out onto the bandstand. You think Prime Time is eight guys playing different things at the same time? Then explain how they all manage to stop on a dime together. All this leads me to Giuseppi Logan, a saxophonist who the Music Hound Jazz Guide said encapsulated the "I can play that" line of thought. When liner notes of that era defended Archie Shepp and dissed "other guys who can't play," they were referring to guys like Logan. On this album, recorded in October of 1964, Logan plays Pakistani oboe, alto and tenor saxes and - they're listed but I didn't quite hear them - flute and bass clarinet. Pianist Don Pullen, making his recording debut, bassist Eddie Gomez and drummer/ESP regular Milford Graves back him up. I'm not here to bury Logan or praise him, but to shed some light on the album. First of all, his tone is pretty weak. As a one-time alto player who never stuck to it long enough to develop a good tone, I know of what I speak. On "Dance of Satan," track number two which introduces us to his alto work, he sounds wobbly, in some cases as if his embouchure failed him as he tried to get into upper register. Had Logan stuck to just alto, he might have progressed at least a little bit more. There are moments, especially in "Dialogue" where he sounds like he could become a player in the same vein as Jimmy Lyons, the altoist who spent most of his career playing with Cecil Taylor. But he dabbles in too many reeds. He switches to tenor in "Taneous," making the bigger horn sound like it's half asleep. Then there's the whole issue of the oboe, which opens the album in "Tabla Dance" a totally free excursion in which Graves plays tablas and Logan wails while Pullen and Gomez pluck and scrape. It's chaotic and loose, but..... they're all playing with a sense of restrain. It's not like the over-the-top screaming that marks Sunny Murray's ESP album. And that aspect of the music makes this album worth revisiting. There are moments where Logan's expression reaches beyond his raw playing, like in "Dialogue." As loose as it sounds, this track even follows something of a structure. Sure it features bleating quarter notes in the bridge, if you can call at that, but they keep threatening to turn it into a ballad. "Bleecker Partita," the 15-minute epic that closes the album, and takes it well over the 35-40-minute length of most albums of that time, is built upon a droning riff that Logan uses as the background for a mournful, emotional solo that proves he does know his way around his horn. Having Don Pullen, Eddie Gomez and Milford Graves back you is bound to put you in a better light anyway, or at least provide some high points when Logan stops soloing. One of the weirdest elements of the record is the sound of the piano on "Dance of Satan" which sounds just like a banjo when Pullen hits a certain chord, making the whole thing transform itself into a free jazz hoedown for a split second, only to shift back to its shambolic, New York City origins. I'd like to think Logan meant for that to happen. 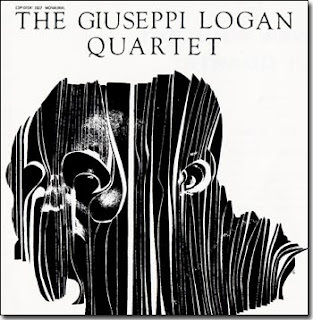 The Giuseppi Logan Quartet is not classic ESP material and bellweather free jazz like Ayler's Spirits Rejoice and Spiritual Unity. But it's not awful-in-an-intriguing way like Erica Pomerance's You Used to Think (not a jazz album, but the polar opposite in the ESP canon). Instead, it's somewhere in between, a curiosity that can stand up to repeated listens. Chances are anyone who has been curious about it picked up one of the myriad reissues of the album in years gone by. If not, ESP's package is essentially as simple as the original. Bernard Stollman offers a quick memory of the album's sessions, although a little more bio or background on Logan's affiliation with the label would've been nice. Everything written about him indicates that no one knows his whereabouts or if he's even alive now. Maybe I'll try to interview Stollman about the disc. We could run the interview here. Bernard, you listening? Enquiring minds want to know. ....you listen to a CD/record and think, "Hmm, this must've been recorded before 1957 because Coltrane hasn't really developed his sheets of sound style on this," and you're right. I've spent the last five or six days in Mosaic-ville. I got the two sets that I mentioned in the last post. Things have changed in my life, let me tell you. Why, gawrsh, son there was a time when a Mosaic box came in the mail and time would stop. It took just about 2 days for me to get through the Cecil Taylor set when that came. And the Larry Young set? Eight discs in about three days. The box arrived on Thursday and I don't think I tapped into the Art Farmer-Benny Golson set until Saturday. True, I did listen to two of the three Chambers discs in one night, I think. And, man, is that good stuff. There are a lot of bass solos but they're all pretty amazing. I was listening to the Bass on Top album (the last one on the set) on earbuds today and Chambers didn't waste a note. By the way, that Coltrane reference at top was going through my head during the first couple songs on the Chambers set. He's good, but the tone is a little softer and the five-notes-on-one-beat approach wasn't happening yet. The interesting thing about the Chambers set as well is that most of the material is original or was written by one of his peers, in many cases, Benny Golson. These guys weren't stuck playing standards or rehashing Charlie Parker (although the set opens with a Bird tune and it is unique since the bass plays the melody with Trane). They were building on the triumphs of the early bop guys and taking it to the next level. You have to wonder why Whims of Chambers doesn't get the same kudos that Blue Trane does. The Farmer-Golson set is also pretty hot, although the solo sets that end the box lack the power of the Jazztet recording on the first four discs. Golson was such a prolific, well-regarded composer that by the time the Jazztet made those albums, a lot of his tunes had been recorded by other musicians. Lee Morgan did a bunch of them on his early Blue Note albums. Benny was also in the Jazz Messengers, who recorded a number of them, including "Blues March." Farmer was a good foil for him, and they have trombone players on the frontline with them - Curtis Fuller, Tom McIntosh and Grachan Moncur III. I need to dig back into it because I only finished my way through it yesterday and some of those spins were done while I was a little distracted. I get a comment - a real live comment, commenting on something I said in one of these entries - and yet I ignore it and retreat for about a month. Dadgum. I've been deluged with music and it's really going to hit full tilt tomorrow. That's when my Mosaic package is supposed to come. I ordered not one but TWO sets from them. One classic big box design, the other a 3 disc Mosaic select set. The latter package is the Paul Chambers one I went on about last summer. Or at least I made reference to one of the albums therein in a posting about buying a bunch of jazz albums. The set features several sessions that Chambers lead for Blue Note and includes John Coltrane as a sideman. The other set is the Art Farmer-Benny Golson Jazztet set. Mosaic was having a sale in July, where selected sets were 15% off. I scrolled down the list and was either uninterested in the selections or had the good ones already. Then I came upon this one. I'm not exactly a big fan yet of the group, though I do think Art and Benny are pretty underated guys, but there was a part of me that wanted to get this set. And another part that said once the set goes out of print, you'll regret not buying it in the summer of 2008. The same way I felt about not jumping on the Miles at the Blackhawk set. Don't get me started. So that's what I'm waiting for. Next time I'll tell you what's been in my ears.